Home | Welcome, Livliga Customers! You’ve got the Livliga Just Right Set™ Bariatric…now, let’s have breakfast! Congrats on your purchase of the Livliga Just Right Set™ Bariatric! I got a chance to test the set out myself and I absolutely love it. It makes portion control easy and stylish with a bowl and plate that don’t overwhelm my eyes or overfeed my belly! Now that you’ve got your set, you’re probably wanting to test it out on some great, weight loss surgery recipes – and the folks at Livliga have you covered! As one of the first people to purchase the Just Right set, you get a bonus. A digital copy of my book, The Bariatric Foodie Breakfast Book. 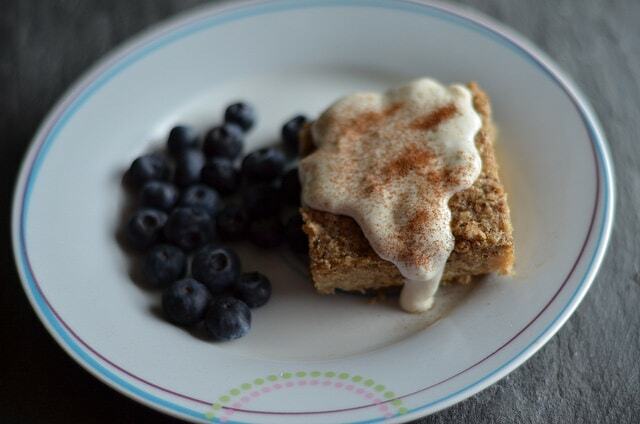 Baked protein oatmeal? Yup, that’s in the book! And now you can eat it on your beautiful new Livliga Just Right Set™ Bariatric. Now let me first say that I am a post-op (9 years post-op RNY, maintaining a 125 lb. loss, woot!) so I know how challenging breakfast can be. But it’s important! Breakfast can help stabilize your blood sugar in the morning and help you control your appetite throughout the rest of the day. I know breakfast is hard after weight-loss surgery, so let me take care of one of the toughest parts by inspiring healthy breakfasts you’ll look forward to! Click the “Download Now!” button below. Enter LivligaBariatric in the discount code window. This should zero out your order.